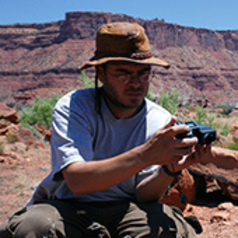 Professor Kristopher Lappin has broad interests in the ecological morphology, functional morphology, biomechanics, and evolutionary biology of animals. Kristopher’s research questions primarily focus on predator-prey interactions and social behavior, using amphibians and reptiles as focal organisms. A major component of his inquiries has been the use of direct measures of animal performance, particularly bite force. Specific topics of investigation have included, for example, sexual dimorphism, animal combat and territoriality, scaling of animal performance, and how aspects of muscle physiology can facilitate specialized behaviors. As a faculty member in the Biological Sciences Department at California State Polytechnic University (Cal Poly Pomona), Professor Lappin is a passionate educator. Courses currently taught include general animal biology, vertebrate zoology, and herpetology. In these courses, he passionately promotes the view that the only way to truly appreciate the form, function, and behavior of organisms is to understand the essential role of their evolutionary history. In addition to undergraduate courses, Kristopher also regularly teaches graduate student seminars on a variety of topics, such as the 6th mass extinction (that’s the one we are currently experiencing), climate change, and evolution. Kristopher has much enjoyed mentoring graduate students pursuing a variety of thesis topics, for example on poison frog tadpole cannibalism (Sean Wilcox), mechanics of ballistic tongue projection in toads (Roy Heng), temperature preferences of the treefrogs of California (Molly Peters), dietary variation of urban lizards (Par Singhaseni), biogeography of sexual dimorphism of alligator lizards (Tony Marino), and contractile properties of the jaw muscles of male lizards that grip their mates for hours during courtship (Allyn Nguyen).